Based on your observations of these two diagrams, explain how electromechanical relays are represented differently between ladder and schematic diagrams. 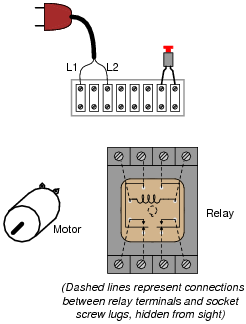 One of the most significant differences is that in ladder diagrams, relay coils and relay contacts (the normally-open contact in this diagram shown as a capacitor-like symbol) need not be drawn near each other. Follow-up question: what do the two labels "L1" and "L2" represent? Discuss these diagrams with your students, noting any significant advantages and disadvantages of each convention. In reference to the challenge question, the symbols "L1" and "L2" are very common designations for AC power conductors. Be sure your students have researched this and know what these labels mean! 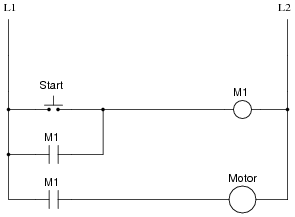 Also, explain the operation of this motor control circuit. What happens when someone actuates the "Run" switch? What happens when they let go of the "Run" switch? 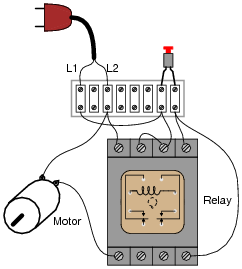 In this circuit, the motor will start once the "Run" switch is actuated. When the "Run" switch is released, the motor continues to run. Follow-up question: this circuit has no ßtop" switch! What would have to be modified in the ladder logic circuit to provide ßtop" control? This circuit is known as a latching circuit, because it "latches" in the ön" state after a momentary action. The contact in parallel with the "Run" switch is often referred to as a seal-in contact, because it ßeals" the momentary condition of the Run switch closure after that switch is de-actuated. The follow-up question of how we may make the motor stop running is a very important one. Spend time with your students discussing this practical design problem, and implement a solution. This question helps students build their spatial-relations skills, as they relate a neat, clean diagram to a relatively "messy" real-world circuit. As usual, the circuit shown here is not the only way it could have been built, but it is one solution. The simplest and least expensive style of electric motor control is the so-called across-the-line starter. 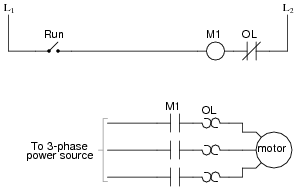 Describe how this motor control circuit functions, and also define the word ßtarter" in this context. A ßtarter" is another name for the large power relay used to conduct current to the motor lines. 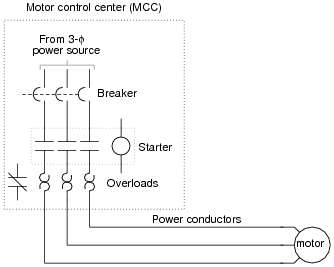 Starters are also known as contactors, and are usually labeled with the letter "M" in ladder diagrams. Ask your students to identify any motor control circuit diagrams they've already seen as being äcross-the-line." If there are no convenient motor control circuit diagrams available for illustration, you may want to ask a student to draw an äcross-the-line" starter circuit on the whiteboard for everyone to see. Although äcross-the-line" motor control circuits are simple and inexpensive, they are not preferred for starting large motors. An alternative to across-the-line motor starting is reduced voltage starting. Identify some of the reasons across-the-line starting is undesirable for large electric motors. I'll let you research the answers to this question! The reasons for using reduced-voltage starting instead of across-the-line starting go beyond electrical! Discuss this with your students. Although the "heater" elements are connected in series with the motor lines as fuses would be, they are not fuses! In other words, it is not the purpose of an overload heater to burn open under an overcurrent fault condition, although it is possible for them to do so. 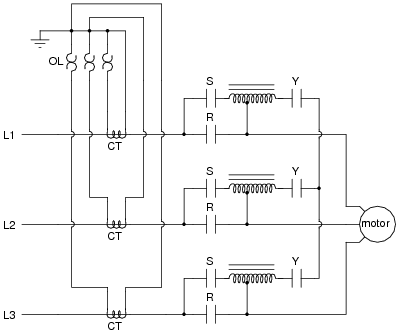 The key to understanding the purpose of an overload heater is found by examining the single-phase (L1 / L2) control circuit, where a normally-closed switch contact by the same name (ÖL") is connected in series with the motor relay coil. How, exactly, do overload heaters protect an electric motor against "burnout" from overcurrent conditions? How does this purpose differ from that of fuses or circuit breakers? Does the presence of overload heaters in this circuit negate that need for a circuit breaker or regular fuses? Explain your answers. When the overload "heaters" become excessively warm from overcurrent, they trigger the opening of the ÖL" contact, thus stopping the motor. The heaters do not take the place of regular overcurrent protection devices (circuit breakers, fuses), but serve a different purpose entirely. It is the task of the overload heaters to protect the motor against overcurrent by mimicking the thermal characteristics of the motor itself. Circuit breakers and fuses, on the other hand, protect an entirely different part of the circuit! Ask your students to describe the information they found on overload heaters through their research. There are different styles and variations of overload heaters, but they all perform the same function. Also, be sure to review with your students the purpose of fuses and circuit breakers. These devices are not intended to protect the load (motor), but rather another important component of an electrical system! An interesting way to explain the function of overload heaters is to refer to them as analog models of the motor windings. They are designed such that at any given current level, they will take as long to heat up and reach their trip point as the real motor itself will take to heat up to a point of impending damage. Likewise, they also cool off at the same rate as the real motor cools off when no power is applied. Overload heaters are like small motor-models with a thermostat mechanism attached, to trip the overload contact at the appropriate time. It is an elegant concept, and quite practical in real motor control applications. 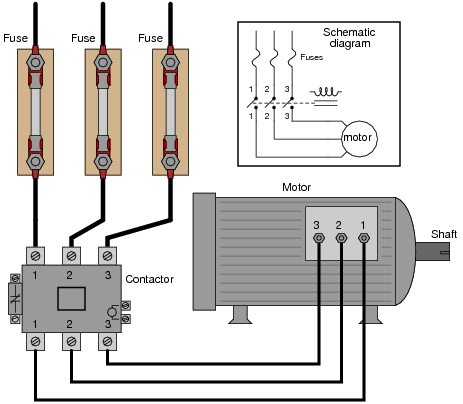 Explain how the reversal of motor direction is accomplished with two different motor starters, M1 and M2. Also, explain why there is only one set of overload heaters instead of two (one for forward and one for reverse). Finally, explain the purpose of the normally-closed contacts in series with each starter coil. 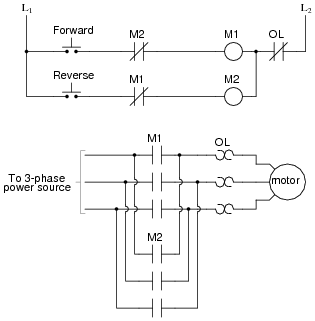 Motor reversal is accomplished by reversing the phase sequence of the three-phase power going to the motor (from ABC to ACB). The existence of only one set (three) heaters may be adequately explained if you consider a scenario where the motor overheats after being run in the "Forward" direction, then an immediate attempt is made to run it in "Reverse." Finally, the NC contacts (typically called interlock contacts) prevent lots of sparks from flying if both pushbuttons are simultaneously pressed! Ask your students to explain exactly why ßparks [would fly]" if both pushbuttons were pressed at the same time. The name commonly given to the NC contacts is interlock, because each one "locks out" the other starter from being energized. Since it is impossible for a technician to be in two places at once, it is often necessary to perform diagnostic checks on a malfunctioning electric motor from the MCC where the technician has access to all the control circuitry. 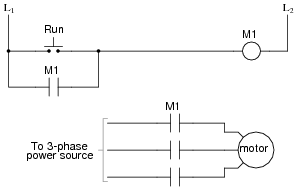 One such diagnostic check is line current, to detect the presence of an open motor winding. 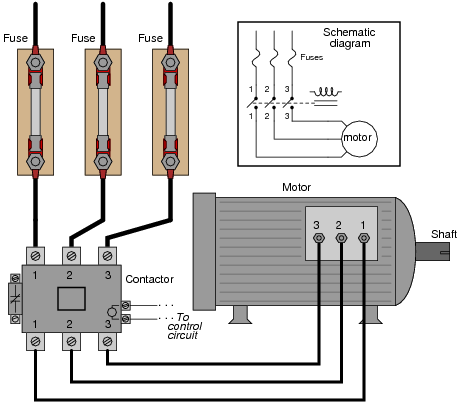 If a three-phase motor winding fails open, the motor will not run as it should. This is called single-phasing. A good way to check for this condition is to use a clamp-on (inductive) ammeter to check line current on all three lines while the starter is energized. This may be done at any location where there is physical access to the motor power conductors. Across each overload heater element he measures about 20 mV AC with the starter engaged. 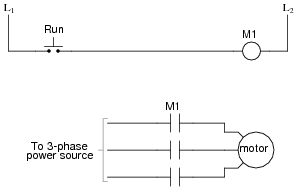 From this he determines that the motor is not single-phasing, but is drawing approximately equal current on all three phases. Explain how this diagnostic check works, and why this determination can be made. Also describe what limitations this diagnostic procedure has, and how a clamp-on ammeter really is the best way to measure motor line current. Each overload heater element possesses a small amount of electrical resistance, which is the key to this diagnostic procedure. Of course, the measurement obtained is strictly qualitative, not quantitative as a clamp-on ammeter would give. Follow-up question #1: what sort of result might occur with this diagnostic check if the motor were indeed single-phasing due to one of the overload heaters failing open? Follow-up question #2: what other causes could there be for a three-phase motor ßingle-phasing" other than a motor winding failed open? I have used this diagnostic check more than once to troubleshooting a single-phasing electric motor. It is amazing what sorts of diagnostic checks you can do with a high-quality DMM and a sound understanding of electrical theory! A popular strategy for AC induction motor control is the use of variable frequency drive units, or VFDs. Explain what varying the frequency of power to an AC induction motor accomplishes, and why this might be advantageous. Variable frequency drives allow for the precise and efficient control of induction motor speed, which is not possible by other means. Central to the answer of this question is the principle of a rotating magnetic field and how rotor speed is primarily a function of line frequency. While the internal details of a VFD are quite complex, the basic operating principle (and rationale) is not. Why is there any time required to re-set an overload heater contact after a "trip"? Circuit breakers can be re-closed mere moments after a trip with no problem, and fuses (of course) can be replaced moments after blowing. Is this an intentional design feature of overload heaters, or just an idiosyncrasy? Also, explain why the reset curve starts to decrease for currents above 300% of the motor's full-load rating. Why doesn't the reset time curve continue to increase with increasing fault current magnitudes? The reset time for an overcurrent heater is an intentional design feature. If the heater is too hot to re-set, then the motor is too hot to re-start. Remind your students that the purpose of an overload heater is to provide a thermal analogue of the electric motor itself. Ideally, the heater heats up and cools down at the exact same rate as the motor. This explains why there is a necessary reset time after an overload heater causes the motor control circuit to "trip." Ask your students to share the common design features of an overload heater, from their research. How do these devices actually function? If your students understand this, they should have no difficulty understanding why overload heater contacts require time to reset after a trip. 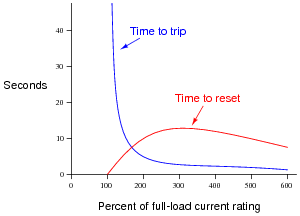 The reason for the reset time curve decreasing after about 300% full-load current is a bit more complex to answer. This, as well, is not an idiosyncrasy, but rather a design feature of the overload heater. Since greater levels of current will trip the heater in a shorter time, they actually heat up the motor less during that brief ön" time than a sustained overcurrent of lesser magnitude. Therefore the motor does not need to cool down as long prior to the next re-start. Protective relays are special power-sensing devices whose job it is to automatically open or close circuit breakers in large electric power systems. Some protective relays are designed to be used directly with large electric motors to provide sophisticated monitoring, shut-down, and start-up control. 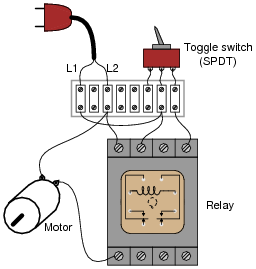 One of the features of these motor-oriented protective relays is start-up lockout. What this means is the relay will prevent someone from attempting too many successive re-starts of a large electric motor. If the motor is started and stopped several times over a short period of time, the relay will prevent the person from starting it again until a sufficient "rest" time has passed. Explain why a large electric motor would need to "rest" after several successive start-up events. If electric motors are perfectly capable of running continuously at full load for years on end, why would a few start-ups be worthy of automatic lock-out? I won't give you a direct answer here, but I will provide a big hint: inrush current. Inrush current is a factor with every motor type, AC or DC. It is easy to forget just how substantially larger a typical motor's inrush current is compared to its normal full-load current. When students consider the magnitude of the currents involved, and also the fact that most electric motors are fan-cooled and therefore lacking in cooling during the initial moments of a start-up, the reason for automatic lock-out after several successive start-up events becomes obvious. Electromechanical relays used to start and stop high-power electric motors (called "contactors" or ßtarters") must be considered a possible source of arc flash. Explain why this is. What is it about the construction or operation of such a relay that invites this dangerous phenomenon? Electromechanical relays interrupt circuit current by drawing pairs of metal contacts apart, separating them with an air gap. Because this contact motion is not instantaneous, it is possible to generate an arc across the air gaps of such magnitude that it becomes an arc flash. Arc flash is just as hazardous to electrical technicians as electric shock, yet I have seen (and worked with) people who pay no attention to the dangers! It must be understood that motor starters are by their very nature arc-generating devices, and that under certain unusual conditions may generate lethal arc flashes. You might want to ask your students what sorts of unusual conditions could lead to a contactor producing an actual arc flash (rather than merely a few small sparks). Explain the operation of this system. How do the autotransformers serve to reduce voltage to the electric motor during start-up? When the "S" and "Y" contacts are all closed, the autotransformers form a three-phase "Y" connection, with line voltage (L1, L2, and L3) applied to the "tips" of the "Y," and a reduced motor voltage tapped off a portion of each autotransformer winding. When the "Y" contacts open, the three autotransformers now function merely as series-connected inductors, limiting current with their inductive reactance. When the "R" contacts close, the motor receives direct power from L1, L2, and L3. 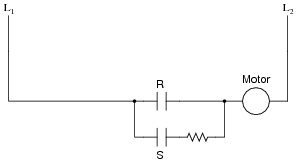 Follow-up question: how do the overload heaters function in this circuit? They aren't connected in series with the motor conductors as is typical with smaller motors! For each step of the start-up sequence, it is possible to re-draw the circuit feeding power to the motor, in order to make its function more apparent. Do not create these re-drawings yourself, but have your students draw an equivalent circuit for each step in the start-up sequence. The follow-up question is a good review of current transformers (CT), as well as an introduction to the use of overload heaters in high-current electrical systems. For each of the proposed faults, explain why they would prevent the motor from starting. Follow-up question: there will be a difference in operation between the L1 fuse blowing and either the L2 or L3 fuse blowing. Explain what this difference is, and why it might serve as a clue to what was wrong. Identifying multiple faults should be quite easy in this circuit. The real value of this question is the opportunity for explanation and discussion that it generates for your students as they share their answers with each other. Identify a good place to check with your multimeter to diagnose the nature of the fault, and explain your reasoning. Try checking for line voltages at the "line" (source) side of the contactor, between terminals 1 and 2, 2 and 3, and 1 and 3, with the contactor energized (motor is supposed to be running). I'll leave it to you to explain why this is a good place to check first. Discuss with your students the various options they have in diagnostic steps, and what they think of the step proposed in the answer. Troubleshooting scenarios such as this as excellent for stimulating active class discussions, so take advantage of it! The "Run" switch is a normally-open pushbutton. Relay coil "M1" is energized by this switch, and actuates three normally-open contacts (also labeled "M1") to send three-phase power to the motor. 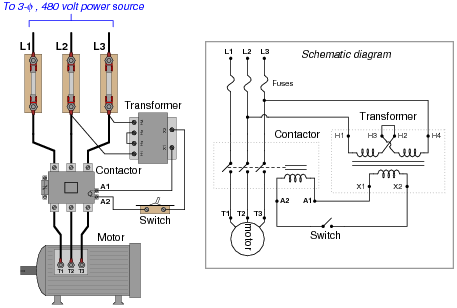 Note that the details of the power supply are not shown in these diagrams. This is a common omission, done for the sake of simplicity. Are the two sources necessarily the same? 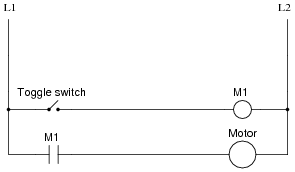 How does the convention of linking relay coils with contacts by name (rather than by dashed lines and proximity) in ladder diagrams benefit multiple-source circuits such as this one? Do these circuits even have to be drawn on the same page? M1 control contact failed open. Wire(s) between M1 control contact and control circuit broken open. This form of motor control circuit is very popular in industry. It is well worth your students' time to study it and understand both how and why it works. As you can see, the symbolism in ladder diagrams is not always the same as in electrical schematic diagrams. 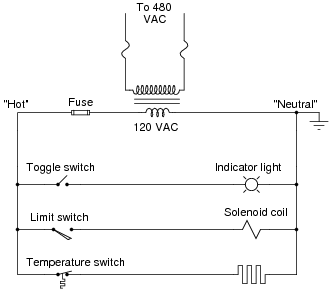 While some symbols are identical (the toggle switch, for instance), other symbols are not (the solenoid coil, for instance). Re-draw this ladder diagram as a schematic diagram, translating all the symbols into those correct for schematic diagrams. While ladder diagrams have their own unique elegance, it may be frustrating for some students to have to learn a new diagram convention. Since ladder diagrams are so common in industry, your students really have no choice. 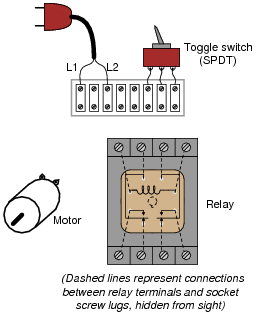 Yes, the "Run" switch shown in the diagram is a SPST, but the switch shown in the illustration is a SPDT. This is a realistic scenario, where the only type of switch you have available is a SPDT, but the wiring diagram calls for something different. It is your job to improvise a solution! Challenge question: which switch position (handle to the left or handle to the right) turns the motor on? 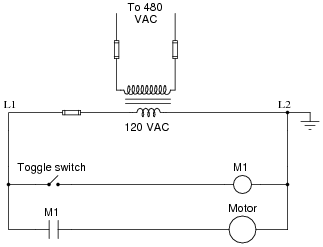 In reference to the challenge question, the particular style of SPDT switch shown is very common, and the terminal connections on the bottom might not be what you would expect from looking at its schematic symbol. After years of faithful service, one day this motor refuses to start. It makes a "humming" sound when the contactor is energized (relay contacts close), but it does not turn. A mechanic checks it out and determines that the shaft is not seized, but is free to turn. The problem must be electrical in nature! Determine at least two possible faults which could account for the motor's refusal to start and the three current measurements taken. Then, decide what your next measurement(s) will be to isolate the exact location and nature of the fault. There are several valid "next steps" you could take from this point. Discuss alternatives with your classmates. This is a practical scenario which you and your students should have some fun exploring. If they have never heard of a "contactor" before, this question is a good opportunity to introduce the component. Bring one with you to discussion if you have the opportunity! Working on a job site with an experienced technician, you are tasked with trying to determine whether the line currents going to a three-phase electric motor are balanced. If everything is okay with the motor and the power circuitry, of course, the three line currents should be precisely equal to each other. Do these voltage drop measurements suggest imbalanced motor line currents? Why or why not? The results are inconclusive, because resistance for the whole fuse and holder assembly is not a reliably stable quantity. Corrosion between one of the fuse ends and the fuse holder clip, for example, would increase resistance between the points where millivoltage is shown measured. Follow-up question: just because the results of these millivoltage measurements are inconclusive in this scenario does not necessarily mean the principle of using fuses as current-indicating shunt resistors is useless. 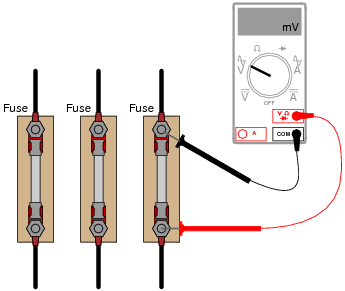 Describe one application where using a fuse as a current-indicating shunt would yield trustworthy information about the current. Challenge question: determine where you could measure millivoltage, that might be more reliable in terms of quantitatively indicating line current. While measuring millivoltage across a fuse may seem like a strange diagnostic technique, it is one I have gainfully applied for years. The "catch" is you have to know what it is good for and what it is not. It is not a precise, quantitative technique by any means! One method of achieving reduced-voltage starting for large electric motors is to insert series resistances into each of the motor's power conductors. When starting, all power must go through the resistors. After the motor has had time to speed up, another set of ßtarter" contacts bypass line power around the resistors, directly to the motor windings. 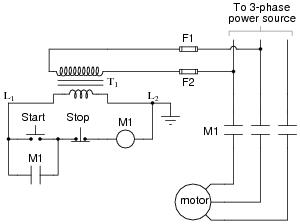 Draw a diagram showing how this could be done for a single-phase electric motor, using two starter contacts: "R" for "run" and "S" for ßtart". Hint: you only need two contacts and one resistor! If students have studied the autotransformer method of reduced-voltage starting, ask them to compare this method against that. Certainly, the resistive method is simpler, but does the autotransformer method have its own advantage(s)?